People often ask me what word they should use to make their dog behave in a certain way. 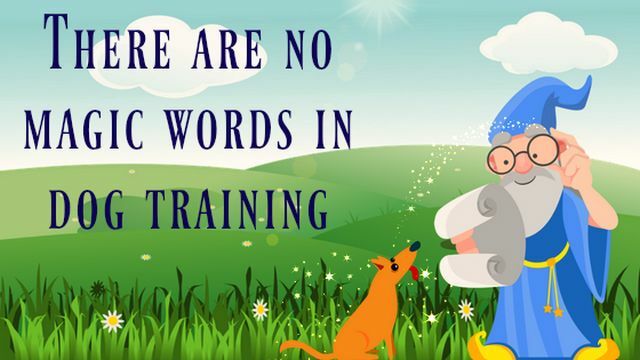 Well, here is the thing: There are no magic words in dog training – unless you train them! Dogs do not understand English (or whatever language we speak). Consequently, you could teach your dog to come to you on a verbal “banana” cue, if you like. People tend to talk a lot and dogs try to filter which words are relevant to them. Thus, you first need to teach your dog the meaning of the words you want him to pay attention to, otherwise those words most likely become “white noise” to your dog and he will ignore them. In order to make a certain word meaningful for your dog it needs to be consistently followed by a consequence. For example, say “sit”, wait a beat and then lure your dog into the sit position. Make sure you say the cue (“sit”) only once, otherwise your cue may unintentionally become “sit, sit, sit“. Be consistent and do not use the same cues for different actions. E.g., if you use the word “down” when you want your dog to lie down then your dog will probably be very confused if you use the same cue when you want him to get off furniture. Avoid similar sounding words as it makes it difficult for your dog to be successful. For example, if you use “back” when you want your dog to back up (walk backwards) it may be a bad idea to use “beg” when you want your dog to sit pretty. 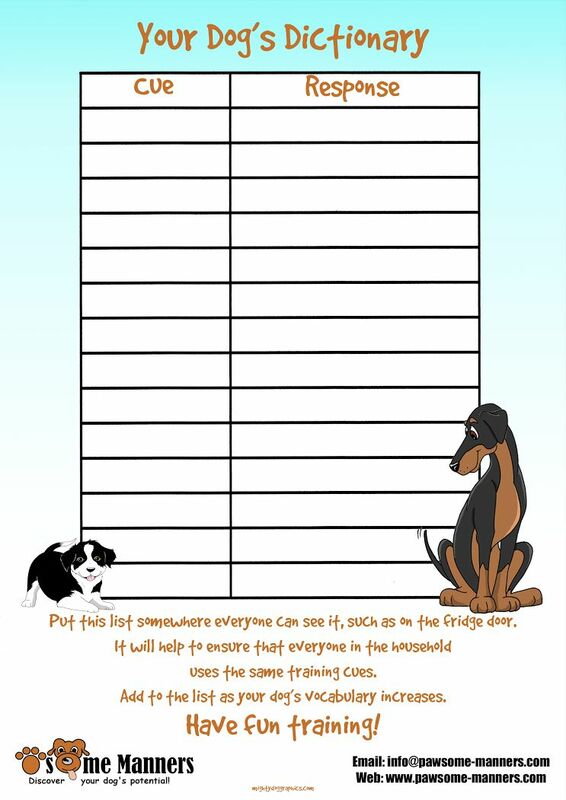 Download your dog’s dictionary below and put it somewhere where everyone in your household can see it so that everyone uses the same words/signals to communicate with your dog.